Our work begins as soon as your order is placed. Therefore, cancellations are not allowed. If you’re order has not yet been printed, it is Printing Peach’s decision as to whether an exception to this rule can be made. If your order has already been printed, there are absolutely no exceptions to this rule. 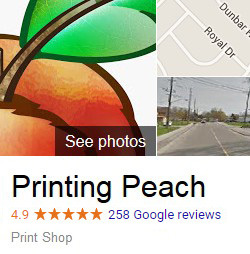 If the order you placed is incorrect and you believe it was a result of our production process, Printing Peach will reprint any order that is due solely to printing error (ghosting, smudges, light ink, incorrect perforations, form alignment, etc.). If the order is being re-printed, no changes in copy, paper quality, quantity, or any such detail shall be allowed. In rare cases we offer refunds, but a reprint is always the first course of action.